News from the World Council of Churches on its 10th Assembly which takes place 30 October to 8 November 2013 in Busan, Republic of Korea. A historic moment in the life of the churches in Indonesia was observed in Jakarta from 17 to 18 May in a Celebration of Unity that brought together 100,000 Christians representing many churches and traditions from all across the country. An upcoming WCC consultation in Bangkok will attempt a distinctive mode of inter-religious dialogue. In a ceremony at the German Protestant Kirchentag, more than a thousand participants offered prayers for the WCC Busan assembly delegates, commissioning them to tread the “paths to peace in the East and West, North and South." The upcoming WCC 10th Assembly is not only a pivotal moment in the life of the global fellowship of 345 member churches but also a defining moment for the WCC and its programmatic and financial partners. “The urgency of life today” drives Christian engagement in mission, say ten contributors to a new issue of the International Review of Mission, which links the new paradigm of mission to the theme of the upcoming WCC assembly. New congregational resource invites "pilgrimage to Busan"
Available now in four languages, a new online publication from the WCC invites parishes and congregations to explore the themes of Christian unity, justice and peace in advance of the upcoming WCC 10th Assembly. At the 50th anniversary of the All Africa Conference of Churches, church leaders from more than forty African countries ask how they can rise up against the shackles of the colonial legacy, conflicts, poverty, class struggles and political upheavals, to unlock Africa's immense potential. While the WCC 10th Assembly is several months away, a foretaste of what young people will bring to the assembly and experience is already developing a rhythm. Pastors from Germany and Argentina reflect on what peace and justice means while a local church in Germany encourages others to do the same through a new resource. The WCC is calling its member churches to observe the International Day of Prayer for Peace on 21 September. The ecumenical calling of churches and exploring different ways of renewing their commitment towards justice and peace was a significant focus during the WCC general secretary Rev. Dr Olav Fykse Tveit‘s recent visit to churches in the United States. While reflecting on the theme of the WCC upcoming assembly in Busan, Indian churches stressed the importance of celebrating life in fullness, vibrancy, dynamism and fervour irrespective of caste, creed, colour, class, gender or ethnicity. With 15 million members of various ethnicities and backgrounds living alongside the world’s largest national Muslim population, Indonesian churches hope to make a dynamic contribution to the upcoming assembly of the WCC in Busan, Republic of Korea. In a call to celebrate Time for Creation, Bartholomew I, Ecumenical Patriarch of Constantinople, encouraged the churches to pay attention to the “human interventions impacting the ecological balance”. Members of migrant and local churches in Geneva will get to experience the life and spirit of the WCC 10th Assembly in their own city on Saturday 14 September. Hopes for strong expressions of women’s concerns for life, justice and peace at the WCC's upcoming assembly were expressed at the 90th anniversary of the Presbyterian Church of East Africa (PCEA) - Woman’s Guild, held recently in Kenya. “Justice and peace now!” was a call made by the participants of the Asia-Pacific Students and Youth Gathering in the Philippines. They affirmed their role in revitalizing the ecumenical movement, aspiring to be “seeds of hope, catalysts of genuine and lasting peace that is based on justice”. As part of the preparations for the upcoming WCC assembly in Korea, young delegates to the event recently got together in Geneva to strategize on making youth contributions to the assembly and to the WCC youth programme more meaningful – envisioning a “youth pilgrimage for justice and peace”. During a recent visit, members of the committee responsible for hosting the upcoming WCC assembly in Busan shared their hope for a “meaningful and successful assembly” which will bring together the worldwide fellowship of WCC member churches in the Republic of Korea for celebration, deliberations and prayer. The 10th Assembly of the WCC begins at the end of October and promises to be one of the most diverse gatherings of Christians in the world. A Peace Train has recently started its journey from Berlin, Germany through Russia and China to northeast Asia and the WCC 10th assembly in Busan, Republic of Korea. The WCC is working toward the revival of “Thursdays in Black”, a campaign against sexual and gender-based violence. 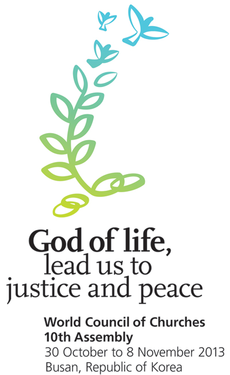 The emphasis is pertinent to the theme of the WCC’s upcoming assembly: “God of life, lead us to justice and peace”. The WCC held its first Youth Virtual Conference titled “Live your Faith!” on 12 October, offering young Christians from around the world an opportunity to reflect on issues of concern for their communities, including eco-justice, migration and peace. In preparation for the WCC 10th Assembly in Busan, Republic of Korea (South Korea), pastors and peace activists in that nation are holding a 40-day “fasting prayer” in front of the Busan City Hall. They are protesting the dangers of nuclear radiation and asking to shut down South Korea’s oldest and incident-prone Kori Nuclear Power Plant, some 20 kilometres from the venue of the WCC assembly. More than 200 international theology students of varied Christian traditions have commenced participating in the Global Ecumenical Theological Institute (GETI). An opening with a vibrant worship service at the Graduate School of Theology of Hanshin University marked the beginning of the GETI on 26 October in Seoul, Republic of Korea. Participants from across the ecumenical membership of the WCC gathered from 28 to 29 October for a Women and Men’s Pre-assembly programme preceding the WCC 10th Assembly in Busan, Republic of Korea. The WCC has had a long tradition and commitment to gender justice and advocacy for a just community of women and men in church and society, a commitment which began at the first WCC assembly in 1948. In a video message shown at the opening of the 10th Assembly of the World Council of Churches (WCC) in Busan, Republic of Korea, Bartholomew I, Ecumenical Patriarch of Constantinople, called on Christians to “pray for the peace of the whole world and for the unity of all”. Rev. Dr Walter Altmann, moderator of the WCC Central Committee, has called “peace with justice” a theme central to the work of the WCC. In a report he presented at the WCC 10th Assembly, he shared some of the principal accomplishments and challenges in the work of the WCC over the last seven years. Participants in the WCC 10th Assembly witnessed a vibrant artistic performance filled with music and drama, telling the story of the national and Christian mission history of Korea. Amidst dramatic events, injustices and crises in the world, God is creating a “new dawn” for the ecumenical movement, said the Rev. Dr Olav Fykse Tveit, general secretary of the WCC. He was reporting at the 10th Assembly of the WCC on the council’s work over the last seven years. He welcomed the coming of this Assembly which he expects to be an event of humility, honesty and hope. “They’re coming, they’re coming,” shouts a young women, looking toward the train pulling into platform 6 at Busan Station. When the doors open, people get off with large suitcases. They look tired – yet incredibly happy at the same time. They’ve traveled from Berlin to Busan, 20 days across Europe and Asia. Their objective: To send out a signal against the division of Korea – and for peace in the country which has been split in two for 63 years. Greetings to South Korea were extended by Chung Hongwon, prime minister of the Republic of Korea, at the WCC 10th Assembly in Busan. In his speech he welcomed the assembly participants, and acknowledged contributions of the Korean churches towards peace, justice and provision of help to the disadvantaged. A plenary session of the 10th Assembly of the WCC delved deeply into the question how, in a world faced with violence, conflicts and discrimination, the “God of life” can lead people, communities and churches towards “justice and peace”. “’God of life, lead us to justice and peace’ has become a prayer around the world.” These were words of Dr Wedad Abbas Tawfik about the theme of the WCC 10th Assembly. She shared her experiences and hopes for social and political stability as a Coptic Christian in her country, Egypt. At the WCC 10th Assembly, the Asia region shared current realities through churches’ voices, cultural symbols and artistic performances. A continent of diversity and religious plurality, Asia is filled with contradictions of wealth and poverty, and a strong resilience. As its churches seek paths toward “justice and peace” in their societies, Asia offers an impressive range of experience. The WCC has devoted 60 years of active commitment to gender justice. The WCC 10th Assembly being held in Busan, Republic of Korea is continuing the campaign for advocacy for gender justice. The WCC, in partnership with Korean women, has designed an encounter space – Umulga SHe-Space in the Madang exhibition hall at the WCC assembly. On 1 November, in the exhibition hall at the WCC 10th Assembly in Busan, Republic of Korea, former general secretary of the WCC Rev. Dr Konrad Raiser discussed his book Religion, Power, Politics. Raiser is a theologian from Germany and author of many works in the area of political ethics and public theology, including For a Culture of Life: Transforming Globalization and Violence. Today the WCC10th Assembly featured a mission plenary. The plenary session presented an action-oriented reflection based on the new WCC mission statement: Together Towards Life: Mission and Evangelism in Changing Landscapes. The plenary sought to highlight the common challenges and opportunities for mission in the current global context. The 10th Assembly of the World Council of Churches elected eight new presidents today during a closed session at its proceedings in Busan, Republic of Korea. A symbolic act of pouring water into one common vessel, carried out by religious leaders representing Christian, Muslim, Hindu, Jewish and Buddhist faiths, marked the significance of water in various religious traditions. This action took place at the WCC 10th Assembly, currently underway in Busan, Republic of Korea. Lit with bright lights and adorned with colourful paintings on the walls, the Raham Centre run by the Gimhae Presbyterian Church in South Korea looks like a day-care centre for children. However, the name Raham, which literally means “womb of a woman” or “womb of God” in the Hebrew language, has deep implications for the work of the centre with the purpose of supporting “migrant wives” in Gimhae. A space set up by the WCC's Ecumenical Accompaniment Programme in Palestine and Israel (EAPPI) at the WCC’s 10th Assembly in Busan, Republic of Korea, shares the realities of people living in the Palestinian occupied territory, through images, presentation and conversations stressing the need for peace in the region. Today the WCC 10th Assembly hosted a unity plenary. The plenary invited participants to reflect on unity and the spiritual journey of fellowship grounded in prayerful reflection. On 9 July 2011, South Sudan became the world’s newest nation. South Sudan today is estimated to be home to more than 11 million people and is geographically one of the larger countries in Africa. The prayer and theme of the WCC 10th Assembly is “God of life, lead us to justice and peace”. What does the prayer for justice and peace means for South Sudan today and in the future? A “safe space” created for dialogue on human sexuality featured stories of pain, exclusion and violence faced by sexual minorities in many parts of the world. This space for dialogue was created in a workshop on 5 November at the WCC 10th Assembly currently underway in Busan, Republic of Korea. On Saturday participants in the 10th Assembly of the World Council of Churches in Busan showed their solidarity with the people of Korea by means of peace messages. They visited the border between South and North Korea, which has divided the Korean peninsula for the past 63 years. Jeju: Island of justice and peace? Twenty-one WCC 10th Assembly participants visited Jeju Island for a weekend program of the event, meeting with those protesting about the building of a naval base on the south of the island. The 10th Assembly of the World Council of Churches has elected the Central Committee today during a closed session at its proceedings in Busan, Republic of Korea. The plenary on justice at the WCC 10th Assembly brings into focus the core of its theme “God of life, lead us to justice and peace.” Following on diverse reflections from around the world on Christian unity, Asia and mission, the assembly plenary on 6 November in Busan, Republic of Korea, highlighted struggles for justice. The National Council of Churches in India has taken a firm stand against casteism and caste discrimination in India. The NCCI Commission on Dalits is exhibiting materials about its campaign “Solidarity with Dalits for Justice and Dignity” in the Madang Hall at the WCC 10th Assembly. The NCCI Commission on Dalits has also created a unique way of raising awareness about casteism. Orthodox and ecumenical scholars presented the Orthodox Handbook on Theological Education and Ecumenism at the World Council of Churches (WCC) 10th Assembly in Busan, Republic of Korea on Wednesday, 6 November. On Wednesday, 6 November, the World Association for Christian Communication (WACC) facilitated a workshop “Hearing Many Voices for Justice and Peace” at the World Council of Churches (WCC) 10th Assembly. The WACC promotes communication as a basic human right, essential to people's dignity and community. “Blessed are the peace makers” is the proclamation in Matthew 5:9. Today the WCC 10th Assembly featured Leymah Gbowee as one of the key speakers at the Peace Plenary, which featured stories, images and signs of hope from God leading toward justice and peace. Perspectives of peace-builders, shedding light on how peace can be achieved in communities, societies and nations, were featured at a plenary session of the WCC 10th Assembly. The plenary focusing on the theme of peace included Nobel Peace Laureate Leymah Gbowee and Korean theologian Dr Chang Yoon Jae. “Join the Pilgrimage of Justice and Peace” is the title of the Message of the WCC 10th Assembly. The assembly in Busan, Republic of Korea, was convened on 30 October and drew to a close on 8 November 2013. An assembly, the highest governing body of the WCC, is held once every seven to eight years to endorse policies, review projects and point the future direction of the organization. In one of their first decisions as the Central Committee for the World Council of Churches, the 150-member committee made history Friday by electing Dr Agnes Abuom of Nariobi, Kenya as the moderator of the highest WCC governing body. Politicization of religion, rights of religious minorities and stateless people, peace and reunification of the Korean Peninsula and just peace served as subjects of the public statements adopted at the WCC 10th Assembly in Busan, Republic of Korea. The WCC 10th Assembly in Busan, Republic of Korea, concluded on 8 November, acting to inspire churches to renew their commitments to justice and peace. Through varied encounters and dialogue within the fellowship of churches, the Assembly has made concrete decisions and recommendations setting priorities for the future work of the WCC. Chief contributions and highlights of the WCC 10th Assembly are available in the newest issue of The Ecumenical Review, a quarterly journal of the WCC.